If you are looking for automotive parts storage solutions, Mustang Material Handling is experienced and capable of handling your requirements. Whether you are a car dealership, specialty service facility, or a warehouse that can utilize vehicle parts storage, or any type of parts storage – we are able to provide a solution that works for your facility. We work with Rousseau for automotive parts storage systems and service department tool storage systems as our primary source. Rousseau Metal Inc. has been manufacturing high-quality products for 65 years. They have become known as a leader in storage solutions. The quality , durability and reliability of their products is among the best in the industry. With all the possible solutions available, let us do the work and figure out the best parts storage solution for your needs. Not finding the parts storage system that is right for you? Please call us at (330)-753-7225. Mustang Material Handling has a qualified team of skilled installers that are available to answer questions about a parts storage solution for your facility. Mustang Material Handling sells, services and installs auto parts storage and warehouse equipment for customers in the Akron, Canton, Toledo, Cleveland, Youngstown, Columbus & Dayton Ohio areas, and also in the Pittsburgh, PA region. A work center is a complete modular system. 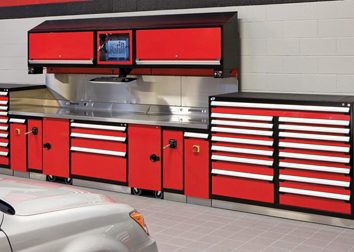 This allows you to create a layout for service tools storage based on many factors, like the space available, the computer access required, the tools you work with, the management of reels, the size of the material to be stored, the type of vehicle lift used or the auxiliary lighting desired. Personalized analysis ensures that the system is built to meet your requirements. Your work environment will be clean, organized, and safe. Your technicians and clients will like it too! With the modular drawer in the shelving unit, you can store all of your department’s small parts. Combine this with robust shelves and you can also store medium-sized parts. 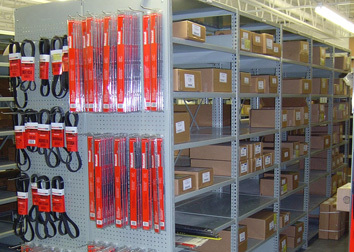 The Mini-racking system and its complete line of accessories can be added to the shelving unit to store large parts. The Rousseau Spider® shelving system was designed to allow you to increase your productivity and save considerable amounts of space. Rousseau also has a vast line of of supports for bumpers, tires, pipes, batteries, etc., which you can use to store the vast variety of parts used in your department. You can use counter cabinets to serve your clients, while keeping high-demand parts close at hand. 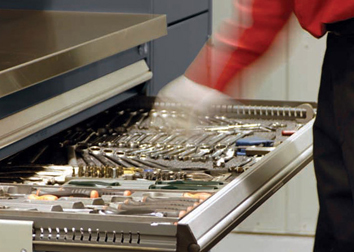 For your valuable tools, you can opt for the robust and durable cabinet system, which is offered with drawers of varying heights, depending on the size of the tools to be stored, and is equipped with shelves and doors to enable you to store more bulky tools; this system includes a series of accessories that make it easier to manage and protect your work instruments. You can also opt for the Rousseau Spider® shelving system, placing your large tools on robust shelves that make it easy to find tools since a specific place is allocated for each tool.